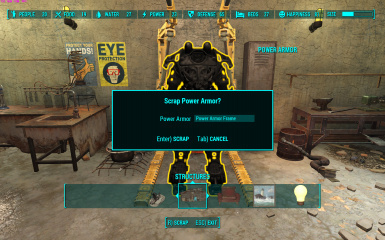 Allows you to scrap and rebuild power armor frames! 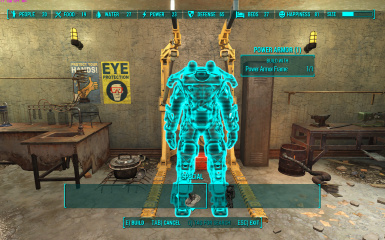 Scrapping a power armor frame will give you a "Power Armor Frame" inventory item that you can use as the "ingredient" to build a brand new power armor frame using the regular workshop interface. 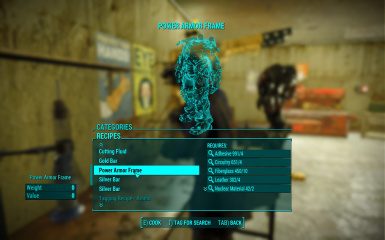 I did it this way instead of using standard scrapping components because I didn't want people building Power Armor Frames out of junk - you will need to scrap a frame in order to build a frame, it's a 1-for-1 exchange. I've put the buildable frame into the Build lists next to the Artillery. Bethesda has finally fixed the cell reset bug, so I've cleared all of the commentary in the description related to the bug. I will be releasing an update for the new PA frames from the Contraptions DLC soon, and I think I've figured out that the v1.5 update is what's done in the ability to scrap frames for some people - it turned out not to be a problem in the mod, it's actually a problem with our save files. Added support for both the Contraptions and Nuka-World DLC packs and updated the FOMOD installer. I've also discovered and made buildable the unused (but vanilla) T-60 Brotherhood rank paintjobs - fair warning, they don't look particularly good, they're the right rank, but they use the "dirty" version of the T-60 armor. I've theoretically managed to update the Brotherhood Knight-Sergeants and Paladins to use their correct frames, however you will still likely see Paladins and K-S's that aren't in the correct frame, because Bethesda also used their name for several leveled NPC's that start out as regular Knights. Note: because of the way that Colter's Power Armor is coded, you can't actually get him out of it, so I've added a frame token to his inventory so that you can build his frame once you get back to a workshop. It has a non-removable power core so I don't know how it will behave if a player tries to use it - I advise letting a follower use his frame if you use it at all. Fixed the incompatibility with FO4 v1.5, added support for both the Automaton and Far Harbor DLC packs, and repacked the whole thing into a FOMOD to hopefully reduce install confusion. Removed the base T-45 frame that you get from the Concord Museum from the "safe" frames list - if you scrap it now you will get a standard token for rebuilding a vanilla frame. I've also added a recipe to the Chem workbench that allows you to build a frame token from normal scrap. I realize it's immersion-breaking and kinda against the lore, but I had a request for it because you can lose frames using the Autopiloting Power Armor mod, and this would be a reasonable way to replenish your supply if you get low. The recipe is entirely optional, and not required for the base mod to work. Added recipes so that when you scrap a named frame, you get a named token to rebuild the frame with (so you can scrap Tessa's Power Armor, for example, and then rebuild it). I've also tweaked the "Gunner" frame variant to be fully leveled - originally they only got the T-45, but considering that they're the pinnacle of Commonwealth military might prior to the Brotherhood showing up, I figured they'd likely have scavenged more than just the lowly T-45's with no helmets. I'm going to release a v1.31 soonish that puts the Brotherhood "Knight-Sergeant" and "Knight-Captain" into the frames that Bethesda made for them, I just need to find all the NPC's that get assigned to be those ranks. As it stands now, Bethesda has all non-named Brotherhood power armor users spawning with the plain "Brotherhood Knight' frame. A very, very bad attempt to make power armor movable via the workshop controls - while it does work, I do not recommend actually using it. I've had so many bug reports on it that it's crazy. Initial release - allows scrapping and rebuild of all power armor frames. During construction I discovered that there's 52 different frames, with several named ones. I've cleaned up the names and now you can tell if you've got a named frame - they don't seem to have any differences, but now that we know that there ARE different frames for different sources, it could be fun to recolor certain frames (raider frames could use a much more "raiderey" look), or to mess with the stats of the special ones.